Research Central is an all-in-one domain and keyword research tool that mashes up SEO intelligence data from Majestic, Moz, Google Ads, Calais, and IBM Watson. Users have the option of discovering detailed information about a domain or URL and diving deep into keyword data to discover opportunities for SEO and PPC campaigns. Research Central incorporates data from major online marketing authorities, including Majestic, Moz and Google. Whether you’re researching websites or keywords for SEO, social media, PPC or content marketing needs, you’ll have a plethora of data to analyze. Online marketers must focus on quality more than ever. Find out if a website has quality scores that indicate it’s trustworthy or to be avoided at all cost. And because quality factors can be subjective, you can select and emphasize the metrics that matter to you. For more insight on quality, it pays off to investigate backlink. Research Central provides in-depth backlink data for entire websites and specific pages. In minutes, you can determine backlink trends — highlights and oddities — to follow up on. Looking for keyword ideas? Enter any keyword as a starting point. Then review related keyword suggestions and search volume data from Google Ads. Find websites that rank for that keyword in Bing. Competitive analysis is a key component of SEO. It’s also time-consuming. You can compare SEO quality, backlink and analytics data for up to five websites from a single view in Research Central. Save that report and revisit it regularly for fast status updates. 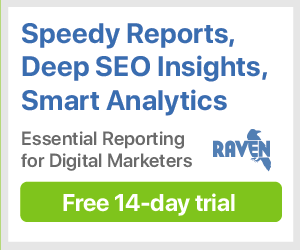 All of this data is fully reportable and is capable of pushing data into other tools on the Raven platform, including Keyword Manager and Link Manager.